It's not a massive change, but it does change the meaning. The word "really" implies (to me) that it "kinda does answer the question, but not well enough for us". If it's a sort of answer, it's not supposed to be deleted; if it's not an answer don't suggest it sort of is. 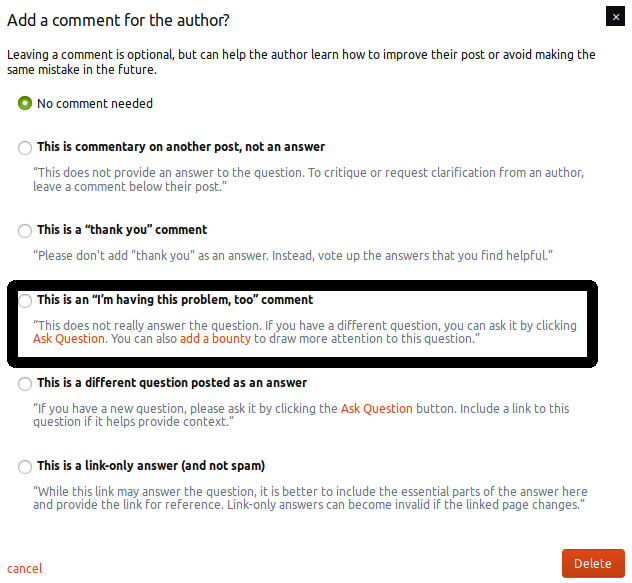 For clarification, it feels like your commenting on answers that are No 2 or No 4, saying that they're No 5 but deleting them (correctly). Worse, I worry that because this comment applies to 5, it will start to be used on 5, and then 5 will be (incorrectly) deleted. Just to play devil's advocate, there are answers that don't directly answer a stated question but that are still perfectly useful and even acceptable answers. Q: How do I overclock my CPU to 17GHz? Not a great example, but do you see what I mean? It hasn't answered the question, but it's done a good attempt at getting there. Very often people ask over-specified things not knowing that it's either impossible or undesirable, or just worthy of a more generic answer. In those cases, a flag like that might be used to shut down an otherwise good answer. While writing the closing to this answer, it occurred to me that we might interpret the message in different ways. Your question might be suggesting the direct opposite of what I've said above. When I read the versions out, I actually put a very different intonation on the words. I've given you the benefit of the doubt but I don't think this works here. Hop it buster. You've posted this in the wrong place. There a difference between the two I hadn't really considered before writing this, but now I have, I don't think it hurts to soften the language. Being told you've done something wrong is bad enough. There's little harm in at least looking like you're willing to accept you could be wrong. 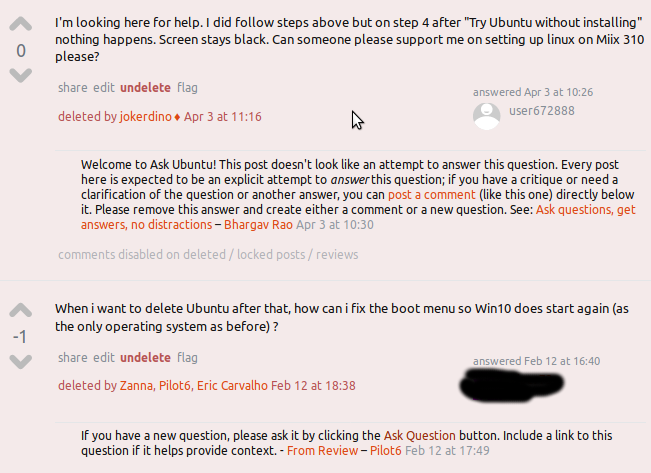 I decided to write an answer in the hope of clarifying the question a bit. To be honest, this isn't an answer, just a really long comment. Irony I guess! 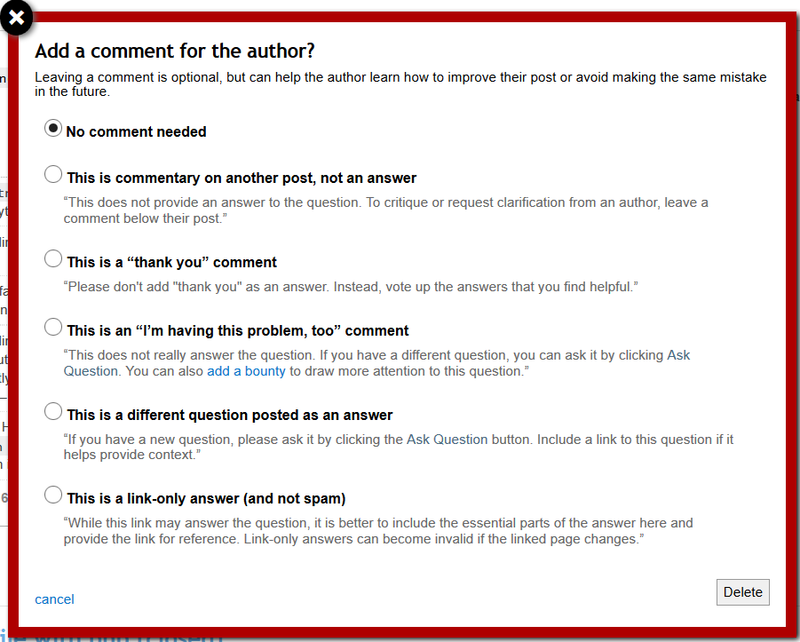 When I first began reviewing the Low Quality Posts queue, I found the "really" in that particular comment to be illogical and confusing to the reader, since most of the posts I was seeing that fit the description of "I'm having this problem too" were not sort-of answers, they were just not answers - the writer had no intention of answering the question. After a while, I started ignoring the canned comments 90% of the time and just writing my own comment if one seemed necessary. This question and the response to it led me to think again about the canned comments and the "really" that I'd always felt was unhelpful. I softened my stance on the "really" after thinking about the plurality of NAAs we get that are like that last one. Sometimes, there is an intention to reply, adding information, and there is a case for saying this sort-of-but-not-really answers the question, so the comment fits. It just doesn't fit them all IMHO. None of the other comments have a "really" softening their tone. It's strange to me still. 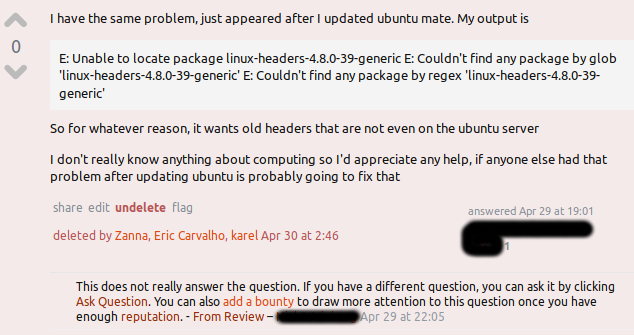 Since "really" is sometimes illogical, I feel it would be better to have something like "this doesn't seem to answer the question", which contains an admission that the commenter might be in the wrong, without creating confusion by suggesting that something that is not even intended to be an answer is sort-of an answer. I think this is much clearer and more helpful than the canned comment and I will be using it from now on.